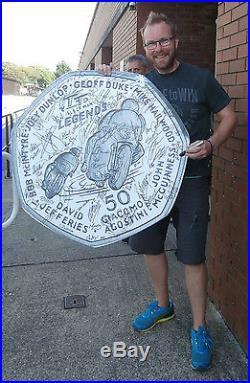 This giant 2015 “TT Legends” 50p replica blow up coin has been signed by more than 70 people with connections to motorcycle racing and the TT Mountain course, including 23-times TT winner John McGuinness and a host of other current and past TT racers, MGP stars, TV and radio presenters, leading race officials and global racing greats. The signatures include past & present TT riders. John McGuinness, Bruce Anstey, Gary Johnson, Dean Harrison, Cameron Donald, William Dunlop, Conor Cummins, Steve Mercer, Dan Kneen, Ivan Lintin, Dan Cooper, Olie Linsdell, Ian Lougher, Maria Costello, Dan Stewart, Dave Molyneux, Dan Sayle, Richard Kneen, James Cowton, Jamie Coward, Danny Webb, Johnny Barton, Des Connor, Sean Callister, Hurst Saiger , Mark Parrot, Alan “Bud” Jackson, Nick Jefferies, Conrad Harrison, Paul Owen, Phillip McCallan, Graeme Crosby, Richard “Milky” Quayle, Helmut Dahne, Mick Grant, Brian Reid, Charlie Williams, Dave Roper, Alex George and Chris Palmer, as well as 2016 Senior MGP winner Tom Weedon. Ex TT riders & now ITV4 presenters Steve Parrish, Steve Plater and James Whitam along with the Radio TT team of Chris Kinley, Tim Glover, Chris Williams, Marc Tyley and Jo Pack, plus TV motorcycle show presenter Henry Cole. Clerk of the Course Gary Thompson, Chief Steward Neil Hanson, Start Line controller Paul Kermode and Pit Lane Controller Alex Downie. Paul Phillips from the Department of Economic Development, Head of Security (& the man in charge of the trophies) Lloyd Mister. 3-times World Enduro Champion David Knight, World Superbike rider Frankie Chili and 4-times World Championship Speedway rider Barry Briggs. Ex rider and now team boss Clive Padgett and Peter Duke, head of “Duke Video” and the son of TT legend Geoff Duke. Top motor sport photographers Stephen Davison & Gary Harrison, Isle of Man Newspapers Sports Editor John Watterson and artist, writer and TT calendar girl Rachael Clegg. And last but not least, “at speeds approaching 100 miles an hour”, Derry “Decca” Kissack & the Purple Helmets. This unique coin measures 91cm (3 feet) in diameter. It is made from a lightweight foam board so it is perfect for wall mounting. It was produced to promote the TT Legends coin series and it is a replica of the 2015 Isle of Man TT 50p coin, the first in the TT Legends series, which features John McGuinness, Joey Dunlop, Geoff Duke, Mike Hailwood, Giacomo Agostini, David Jefferies and Bob McIntyre on the reverse, with the Queen Elizabeth II official coinage portrait on the obverse. The giant replica coin in the photos is a one-of-a-kind item and is the. 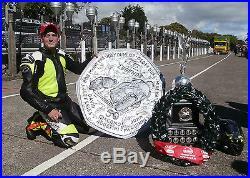 The coin was exhibited at the paddock during the 2016 Isle of Man TT, Classic TT, Manx Grand Prix and also at the Festival of Jurby. Those of you who were lucky enough to be at any of these events will probably have seen it there. From the sale of the coin will be split between the. Isle of Man TT Marshals Association. Which both play a vital role in road racing on the Isle of Man. Maxine Cannon, General Manager, Isle of Man Stamps & Coins, said: We had this replica created to promote our TT Legends 50p coins, and it was photographed alongside many of the biggest names from the TT and world of motorcycle racing. More than 70 stars agreed to sign the coin, and now wed like to give fans this opportunity to own a truly unique collectable. The TT Legends coins proved exceptionally popular, and we expect there to be a huge demand for this giant version. This Coin is a replica of our 2015 Isle of Man TT Legends 50p Coin. A second TT Legends 50p, featuring the names of Michael Dunlop, Stanley Woods, Steve Hislop, Bruce Anstey, Dave Molyneux, Mick Grant and Ian Hutchinson, was released for the 2016 TT. This rare item of TT memorabilia comes to you from the Isle of Man, the road racing capital of the world. This coin has passed between over 70 motorcycle greats in the Isle of Man TT paddock and will have marks. Isle of Man Stamps & Coins have been making their mark with collectors all over the world since July 5th 1973. As well as its stamps, the Isle of Man also creates acclaimed coin issues and has been striking coins for over 25 years – Manx coinage is amongst the most innovative in the numismatic world. Collect Isle of Man stamps and coins and we guarantee you will discover a wealth of fascinating facts about the Isle of Man – you may also discover a passion for collecting to last a lifetime! We deliver worldwide for FREE. Isle of Man Stamps and Coins PO Box IOM Isle of Man Post Office Douglas ISLE OF MAN IM99 1PB. 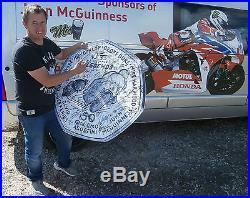 The item “GIANT ISLE OF MAN TT 50p SIGNED BY OVER 70 INC McGUINNESS DUNLOP ANSTEY McCALLEN” is in sale since Saturday, October 01, 2016. This item is in the category “Coins\Coins\British\Regional Issues\Isle of Man”. The seller is “iomstampsandcoins” and is located in Douglas. This item can be shipped worldwide.